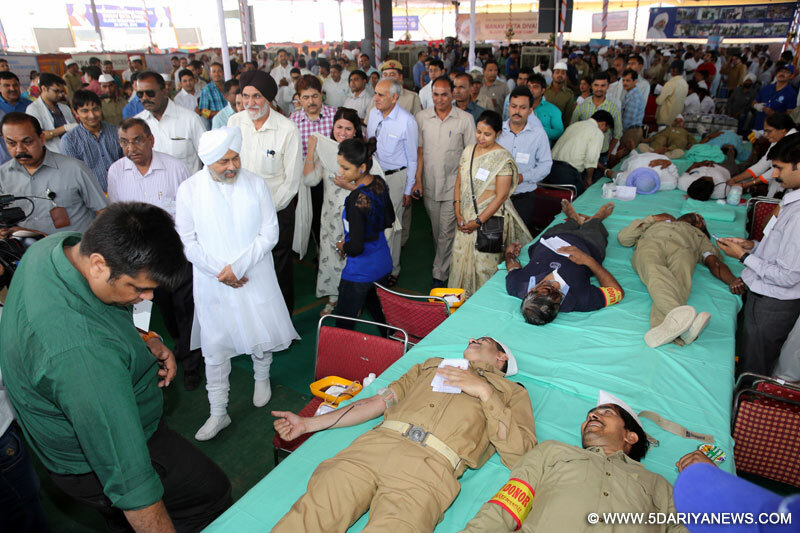 The Sant Nirankari Mission organized 79 blood donation camps across the country on Sunday, April 24, 2016 to commemorate the supreme sacrifice of the former Heard of the Mission, Baba Gurbachan Singh Ji who laid down his life on this day in 1980. The Mission paid tributes to hundreds of devotees who also sacrificed their lives for the noble cause of truth, love and unity.Organized under the auspices of the Sant Nirankari Charitable Foundation, the series was inaugurated in Delhi by Nirankari Baba Hardev Singh Ji Maharaj. The blood collecting teams came from Guru Teg Bahadur Hospital, Dr. Hedgewar, Dr. Ram Manohar Lohia, Safdarjung Hospital, G.B. Pant, DeenDayalUpadhyay, Dr. Baba SahebAmbedkar, Kasturba Gandhi, SuchetaKriplani, Bara Hindu Rao, LNJP Hospital, Indian Red Cross Society, Armed Forces Transfusion Centre and AIIMS – CNC. Devotees donated a record number of 1589 units of blood. For the first time, the proceedings of the camp were publicized over social media as a part of International Humanness Blood Drive of the Mission. Speaking on the occasion, Baba Ji said that since 1986 the Mission has been organizing blood donation camps along with other social welfare activities as a mark of their service to humanity. He described the donation of blood as the noblest service because it sought not only to help the patients to recover from various diseases but also acted as a life saving measure.Baba Ji said that devotees of the Mission come forward to donate blood with enthusiasm not only in India but in other parts of the world also. Nirankari volunteers abroad go to their local hospitals and donate their blood not only on this day but throughout the year. Baba Ji also mentioned that the Mission has its own blood bank too. It was inaugurated in Ville Parle, Mumbai on January 26, 2016 andit is collecting blood in the ChemburBhawan blood donation camptoday for the first time.Besides Delhi,the other camps include: 12 in Uttar Pradesh; 11 in Maharashtra; 6 in Rajasthan; 5 each in Madhya Pradesh, Punjab and Haryana; 4 each in Gujarat, Bihar and Himachal Pradesh; 3 each in West Bengal, Jharkhand and Uttarakhand; 2 each in Odisha and Jammu and Kashmir; and one each in Chandigarh, Assam, Andaman, Goa, Chhattisgarh, Andhra Pradesh, Karnataka, Kerala and Tamil Nadu. Earlier, Brig. PS Cheema, Member Incharge of Health and Social Welfare Department and Member of Sant Nirankari Charitable Foundation said that the devotees turn up with great enthusiasm to donate blood because they are guided by the inspiration from Baba Hardev Singh Ji Maharaj who says “Blood should flow in veins and not in drains.” He also mentioned about other activities undertakenby the Foundation towards the service of community. Prior to blood donation camps, Sant Nirankari Sewa Dal organized a bike rally to create awareness and inspire citizens about this noble service to humanity. Flagged off by Shri JS Khurana, MukhyaSanchalakSewa Dal, the rally stared from Model Town and concluded at the venue of the blood donation camp after passing through Dhaka, Dr. Mukherjee Nagar and Sant Nirankari Colony. His Holiness Baba Hardev Singh Ji Maharaj blessed the participants.